REHOBOTH, MASSACHUSETTS – 09/11/18 — IronZog LLC announced today that their Kickstarter-funded open world strategy game War of Conquest will be released through Steam’s Early Access program on September 20th. What sets War of Conquest apart from other massively multiplayer nation building strategy games is that all players co-exist on a single game map. In addition to the free-for-all war fought on the game’s main continent, nations can raid one another’s home islands, in a one-on-one matchmaking mode that’s especially geared toward solo and casual players. 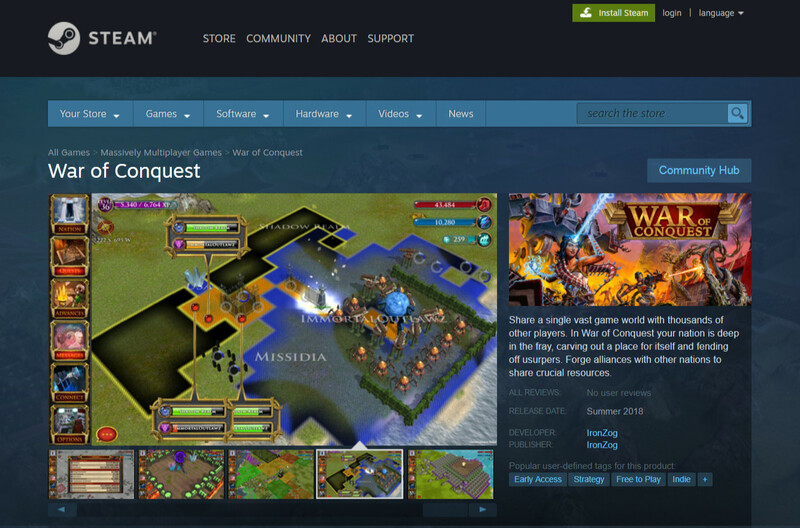 War of Conquest will be released for Windows on Steam Early Access September 20th at 12pm Pacific time. It will also be available for Linux and Android through warofconquest.com. After the Early Access period is complete, the game will be released for PC on Steam, for Android through the Google Play store and for iOS though the Apple App Store.